Come one, come all to celebrate the great anime that is Gintama, one which never fails to entertain! A currently ongoing series, here is a list of things I have picked which, unlike other long running anime series, Gintama gets right (as much as I like Bleach and Naruto, there are times when I just find them boring). Some anime don't do this, but Gintama doesn't fail to amaze. You have Shinpachi who's often worried about what the viewers will think about their actions etc., followed by Kagura and Gintoki about not caring as they feel like the anime is a failure anyway. 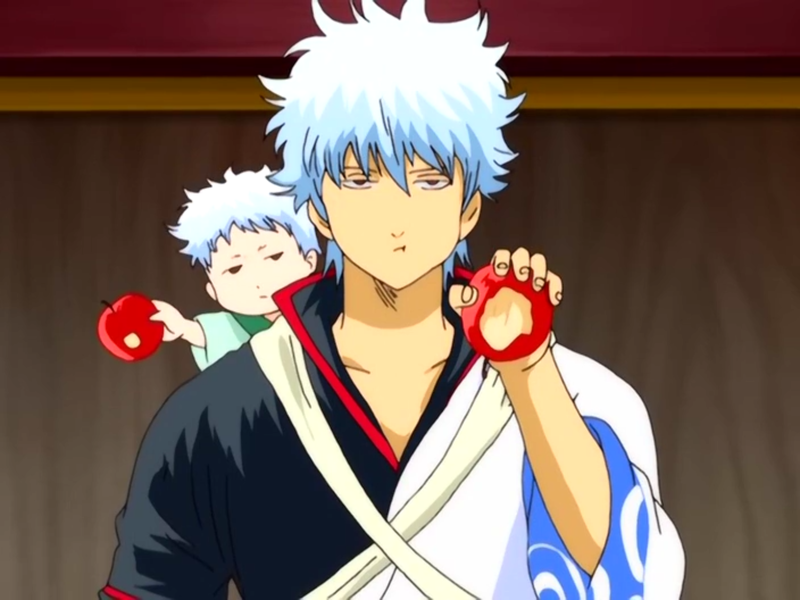 In the new season, there were a couple of minutes where Gintoki was talking bad about the anime's creators during his public apology and didn't even care. Gintama is never afraid to bring in new parodies and include as many characters as they can when they do. For example, the Nintendo parody included Katsura and Elizabeth who dressed up as the Mario Brothers, and the Shinsengumi, a combination which we know screams trouble. Add this with the Odd Jobs trio, and you get a full on battle to win the parody console which, as we all know, doesn't end well. There are times when Gintoki is with Hijikata, and do those episodes entertain. They are the total opposites, but when you see the two together you know the comedy will be delivered. If you're unsure, check out the episodes where they're handcuffed together, and another when Hijikata has to look after a person who sees Gintoki and starts to annoy him. Aww Sadaharu, you big, fluffy, innocent-looking, head-biting dog. Probably one of the main characters that doesn't get as much screen time as the others, you know things get better when Sadaharu gets some attention even when you just see him asleep. Fans will know that the Shogun always gets the wrong end of the stick when in the company of the Odd Jobs trio. And the poor Shogun is just trying to get a feel of what his subjects do in their daily lives. Still, isn't it entertaining? The comedy never falls short throughout the anime, despite the seriousness that comes in when it needs to. I mean, they have an episode where they're trying to name a monkey which turns out to be 2 minutes' worth of names in the end. We can't forget the characters that make the anime. From a mayonnaise-loving Vice Captain to an innocent-looking-but-deadly older sister, Gintama has a wide range of characters who never fail to entertain.